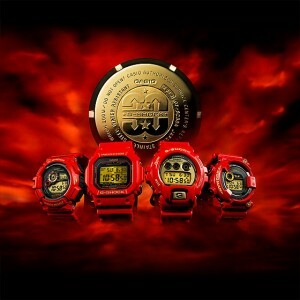 Casio G-Shock Anniversary Collection.Without noticing it's been nearly 30 years since the first Casio G-Shock. Since the early models, a lot different from those of today, everyone quickly realized that those watches would be the benchmark for strength and durability. Personally, I still have the first model Casio that I was given about 20 years ago, is not in good condition due to the use of my adolescence, but it still works and is still able to have their say. What better occasion of the 30th Anniversary of the brand put on the market for a special series of watches called Rising Red Anniversary Collection? There are five models that embody perfectly the style Casio G-Shock GW-M5630A, the DW6930, the G9330 MUDMAN, there are two variants of the FROGMAN diver. The whole collection is characterized by the color red, shiny or matte depending on the model and the details of the gold dials. All watches bear the mark 30 anniversary engraved on the case back, which is designed in the legendary New York artist Eric Haze, working now for about 15 years with Casio watches. I do not know if these models have already been ordered and when they are actually available for the Italian market, but I know that will buy at least one. I’m sure the fans of the brand will not want to miss the opportunity to get your hands on at least one of the models that have made the history of the brand, especially if it is a limited edition.